Today is the last day of year 2012 and maybe be the best time to summarize my Oracle related activities in the year. Optimizing Oracle database performance using Solid State Drive, specifically the PCIe Flash SSD. 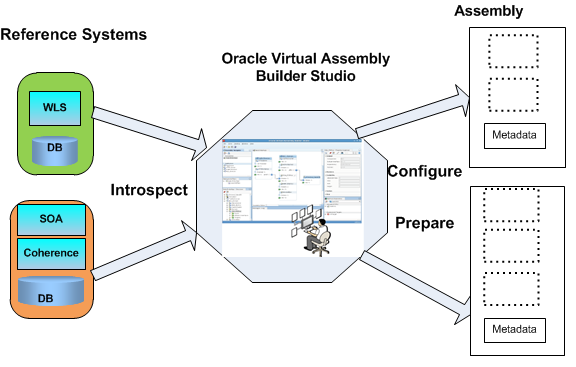 Oracle Virtual Assemblies and Oracle Virtual Assembly Builder. 2. Virtualizing Oracle E-Business Suite through Oracle OVM , Modified version of the Original conference whitepaper Oracle E-Business Suite: migration to Oracle VM Template Based Deployment. 3. Configuring and Managing a Private Cloud with Oracle Enterprise Manager 12c, IOUG Collaborate 12 Conference whitepaper, April , 2012. 4. Virtualizing Oracle 11g/R2 RAC Database on Oracle VM 3.0: Methods/Tips, IOUG Collaborate 12 Conference whitepaper, April , 2012. 5. Virtualizing Oracle 11g/R2 RAC Database on Oracle VM 2.2: Methods and Tips, published in IOUG SELECT Journal Q, 2012 issue. Oracle E-Business Suite: Migration to Oracle VM & template based deployment, EMEA#12, Finland, . Oracle E-Business Suite: Migration to Oracle VM & template based deployment, EMEA#12, Latvia. In last few months of the year, my focus has been on the new Apress Oracle book “ Expert Oracle RAC” which I co-author with three industry well-known RAC experts and Oracle ACE directors: Syed Jaffar Hussain, Riyaj Shamsudeen and Tariq Farooq . I have been working on the contents including RAC architecture overview, Storage and ASM, Clusterware, Network, Application Design Issues , Challenges in a Complex RAC Environment. At Oracle OpenWorld 2012, I was granted the industry prestigious award: 2012 Oracle Excellence Award : Technologist of the Yeafor Cloud Architect by Oracle Magazine. This award will be officially announced on Oracle Magazine ‘s January/Feb 2013 issue. 1. 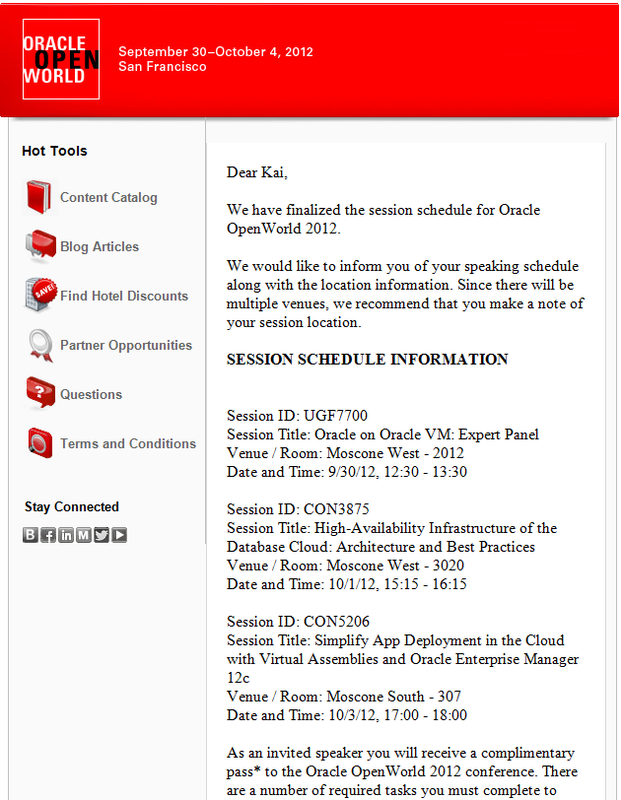 UGF7700 – Oracle on Oracle VM: Expert Panel, Sunday Sept 30, 12:30pm-2:00pm, Moscone West- 2012. On this panel I will share some experience of configuring an Oracle VM virtual infrastructure and an infrastructure cloud based on commodity hardware with Oracle VM3.1.1 and Oracle Enterprise Manager 12.1. This session will start with the architecture design and then discuss various techniques and options for achieving high availability including Oracle Clusterware/Oracle Real Application Clusters (Oracle RAC), Oracle Data Guard, and Oracle Maximum Availability Architecture. Then it will explore the configuration best practices for ensuring fault tolerance of the entire stack of the infrastructure. It will also cover the methods for reducing downtime during events such as system upgrades and migration and how to do troubleshooting during system outages. The biggest annual Oracle community event IOUG/OAUG/QUEST Collaborate conference will be held from April 22-26, 2012 at Mandalay Bay Convention Center in Las Vegas. This year, I was asked to organize two educational events during the conference for IOUG: Oracle EM12c Deep Dive and High Availability Boot Camp. In addition I will give three technical presentations and attend a few panel discussions. Here are the detailed agenda. Abstract: Recently Oracle released Oracle Enterprise Manager 12c cloud control as a total cloud control solution that provides a complete lifecycle management of the entire IT infrastructure. This deep dive will provide an educational opportunity focused on this new management solution. First you will learn the best practices of how to install and configure Oracle Enterprise Manager 12c along with how to upgrade your current Enterprise Manager grid control to the new 12c cloud control. Then you will learn how to leverage some of the best features of Enterprise Manager 12c to manage your IT infrastructure. Finally, you will explore how to use Oracle Enterprise Manager 12 to manage a provide cloud infrastructure. 2. Manage IOUG Collaborate 12 High Availability Boot Camp at Room 8, Monday, April 23, 9:45am-Tueday 24 5:30pm for12 HA Boot Camp sessions:#334, #548, #840, #225, #649, #184, #371, #633, #544, #711, #492, #373. Abstract: Virtualization technology provides the solution to enable the server partition and consolidation for improving the resource utilization and archiving the great flexibility and high availability. Combining Oracle VM with Oracle RAC provides the Database Cloud ready architecture to consolidate the data center infrastructure. The new Oracle VM 3.0 release not only improved the scalability, but also introduced the new Oracle VM Manager to provide centralized management and simplify and automate network and storage configuration. This session will share the experiences of author’s experience on Oracle VM 3.0 through beta program to the production release and give a step-by-step guild to configure such a virtual infrastructure for Oracle 11g R2 RAC database You will learn the basic Oracle VM architecture as well as the tips and tricks of configuring networks and shared storage through Oracle VM Manager 3.0 on the Oracle VM server layer as well as the Oracle virtual machine level to support 11g R2 RAC database deployment and operation. This presentation also discuss the Oracle RAC VM templates for the rapid deployment of Oracle RAC cluster on Oracle VM and some configuration best practices and methods to monitor and manage the performance of RAC database on Oracle VM with Oracle Enterprise Manager 12c. Abstract: Recently released Oracle Enterprise Manager 12c Cloud Control provides a complete, out-of-the-box integrated solution for total private cloud management. This session will have a step-by-step walk-through for cloud and self-service administrators who are setting up a private cloud based on Oracle VM 3.0 provide infrastructure as a service (IaaS) and platform as a service (PaaS). You will learn the experiences from our private cloud project that helps speed your cloud deployment and minimize risk. The presentation also shows how to provision application services by using Oracle Enterprise Manager 12c self-service capabilities and manage application capacity dynamically. Description: Virtualization is the foundation stone in the Cloud Computing era. The speakers will present, detail & elaborate Comprehensive Concepts Overview, Insight, Recommendations, Best Practices, Current Strategies, Pros & Cons, Relevance/Role in Cloud Computing, Prevalent/Dominant Paradigms & Technologies and, a whole lot more about Virtualization as, it relates to Oracle DBAs from the perspective of Oracle on Oracle VM. 8. Oracle RAC Expert Panel: schedule not confirmed.